A sweet roll recipe you can’t live without! 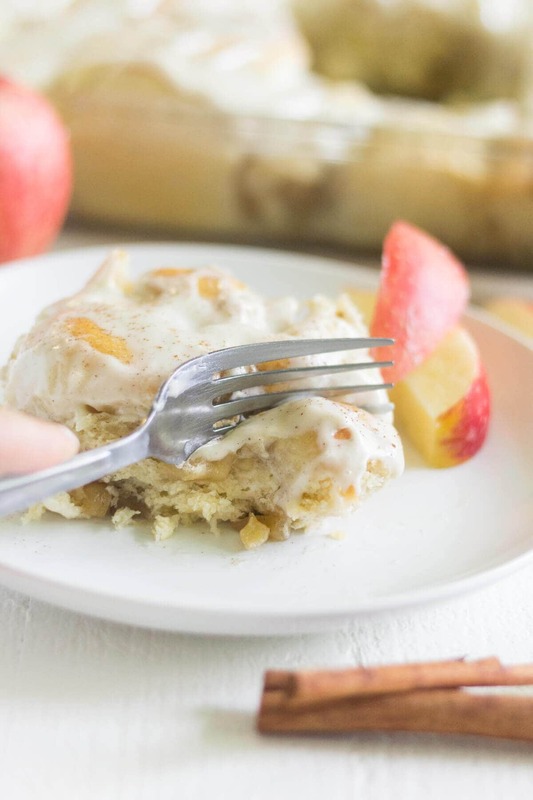 Filled with caramel, apples and cinnamon, these caramel apple sweet rolls are made for fall mornings! We just passed the very first day of fall everyone! I’m sure some of you are just excited as I am. 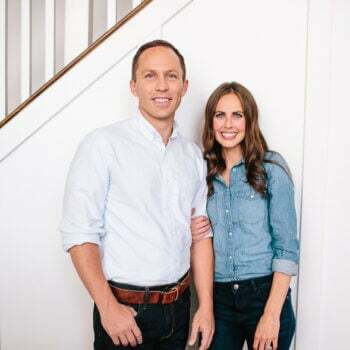 I’m dying to hear what you’re favorite part is. Mine is definitely comfy sweaters, and football tailgating! Oh and of course, caramel apple sweet rolls! Another one of my favorite things to do as we head into the fall is apple picking. There’s an awesome fruit farm down the street and I love to go on Sunday mornings and fill a giant bag with the freshest apples. There’s just something about hand picking an apple that makes me happy. Granny Smith apples are generally our go-to baking apple, but these six apples also bake well, Jonagold, Honeycrisp, Braeburn, Mutsu, Winesap, and Pink Lady. These apple all keep their structure, which keeps the chunks of fruit from turning into bland pockets of apple mush after spending some time in the oven. I love knowing every single apple in my fridge was especially chosen by me🍎. 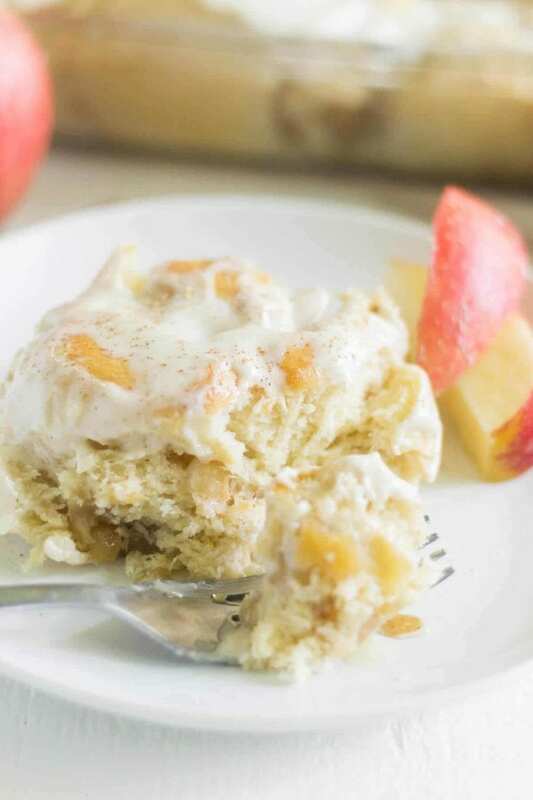 Before I made this caramel apple sweet roll recipe I went to the fruit farm and got tons of apples and peaches to make recipes. I made this gluten free peach cobbler and started on these caramel-y, cinnamon sweet rolls. 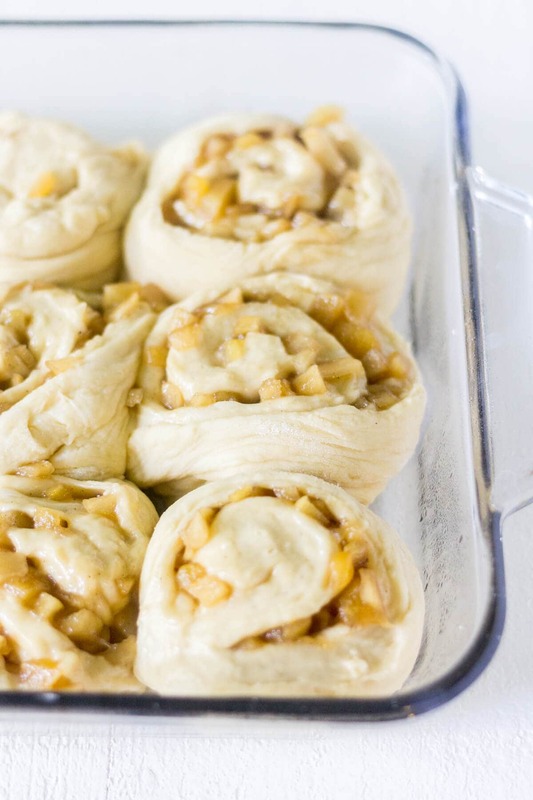 My favorite part about these rolls is of course the caramel apple filling, but the soft and tender dough definitely gives the filling a run for its money when it comes to taste and texture. This dough is so soft and almost melts in your mouth it’s so light. It’s even better when it’s warm! When you get this dough right it really is magical because they’re so sweet, soft and delicious. Can You Freeze Caramel Apple Sweet Rolls? Baked rolls can be frozen up to 2-3 months. Thaw overnight in the refrigerator and warm up before enjoying. 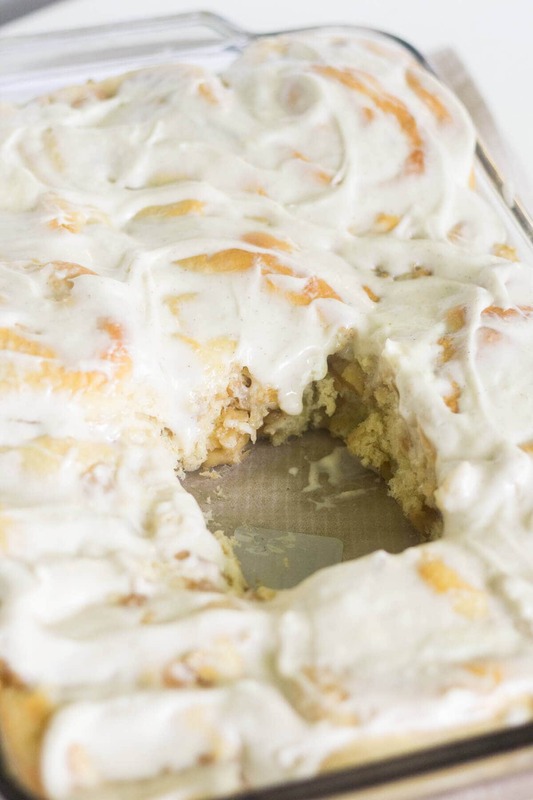 Making a homemade sweet roll recipe from scratch shouldn’t be a scary process! As long as you proof your yeast and it passes the test you’re golden. The reason you “proof” or “prove it’s a good batch of yeast” is because that’s what makes this dough rise and creates the texture. If the yeast isn’t working properly you won’t get the texture you’re looking for. 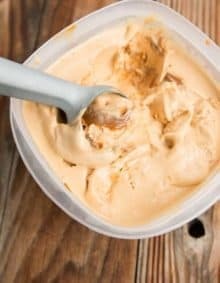 How Do You Proof Yeast? The proofing process is really simple. Heat milk in the microwave or stove until it reaches about 95°F. Using a thermometer is best here if you have one! I like to put my milk in the microwave on high for 20-25 seconds to reach the desired temp. Once it’s warm, add the active dry yeast and whisk gently then cover with a towel and let it set for 5-10 minutes. The yeast should dissolve and create a layer of foam on the top of the milk. If it does that you’re good! If it doesn’t, pitch it and try another pack of yeast! 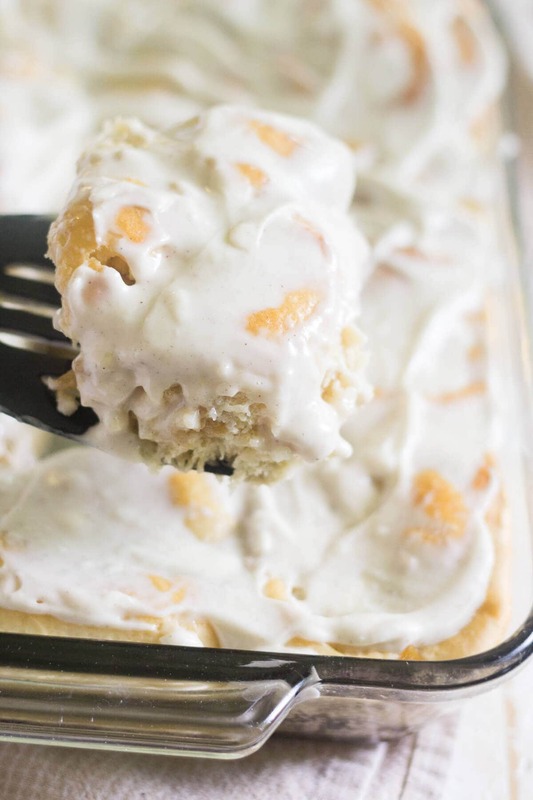 Once the yeast is proofed you’re ready to make this sweet roll recipe! To make sweet rolls from scratch you start with milk, sugar and yeast that’s been proofed. You’ll add in the rest of the ingredients (eggs, butter and flour) and use a dough hook to combine everything. Transfer the dough to a well-floured surface and knead by hand for another minute. While it’s rising make the filling then roll the dough out, spread the filling inside and roll it back up into a long log. Cut into about 12 even rolls and place them in the baking pan. Cover rolls again and place back in the oven for about 30 minutes to rise one more time. I know it’s a lot of steps and time but TRUST ME the texture of this dough is sooo worth the time and love. 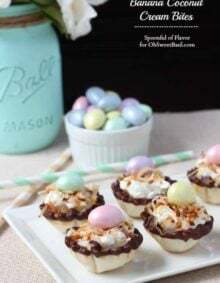 If you are having company in town and know you want to make these but may not have time to make them while the company is there, this sweet roll recipe is perfect for making ahead of time. I love to make recipes, especially baked goods, ahead of time because it’s so stress free. 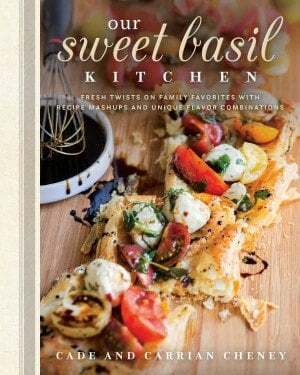 You make the recipe when you have time and it’s convenient for you and when you’re ready to share it you have a delicious, homemade recipe ready to go. Baked sweet rolls can be frozen for up to 2 months before reheating. Thaw the caramel apple sweet rolls overnight in the refrigerator and warm them up in the oven at 375°F for 15 minutes. Once heated, make and add the frosting on top and serve immediately! 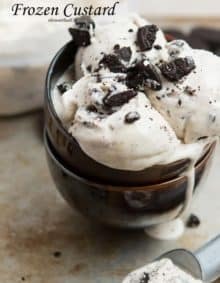 I hope you enjoy this recipe as much as me and my friends did! Don’t forget to comment and tell me what you think! 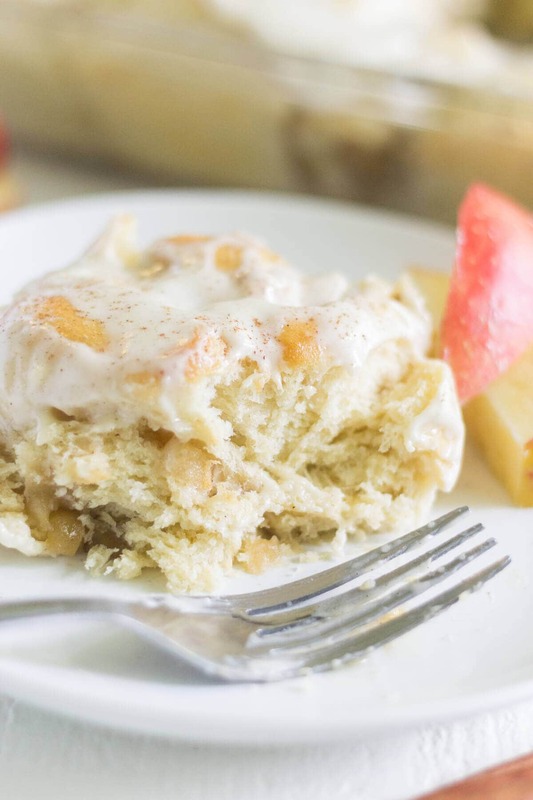 A sweet roll recipe you can't live without! Filled with caramel, apples and cinnamon, these caramel apple sweet rolls are made for fall mornings! Heat milk to about 95°F using the microwave or stovetop. I heated the milk for 20-25 seconds in the microwave. Pour the warm milk into the bowl of a stand mixer fitted with the dough hook attachment. Whisk the sugar and yeast into the milk and cover with a towel. Let sit until the yeast is foamy, about 5-10 minutes. If the yeast doesn't dissolve and foam start over with fresh active yeast as it likely isn't active. When yeast is foamy beat in the melted butter. Next add the eggs, one at a time, and then the salt. The butter will stay sort of lumpy. On low speed, slowly add the flour. When it's incorporated, beat turn up to medium speed until a soft dough forms, about 2 minutes. Increase speed to medium-high and beat until the dough is soft, about 6 minutes more. Knead the dough by hand in this step if you don't have a stand mixer. Transfer the dough to a well-floured surface and knead it with your hands for an additional 1-2 minutes. Form the dough into a ball and transfer it to a lightly greased bowl. Cover the dough loosely with plastic wrap or a towel and let sit in a warm place until doubled in size, about 1 to 1½ hours to 2 hours. While dough is rising, make the filling. In a medium saucepan over medium-high heat combine together brown sugar and butter. Heat about 4 minutes until melted and smooth. Stir in chopped apples, cinnamon and nutmeg and bring to a boil for 3 minutes. Slowly drizzle in the heavy cream and boil for another 3 minutes. spray a 9x13 inch baking pan with non stick spray and set aside. Turn the risen dough out onto a well-floured work surface and roll into a 12x18 inch rectangle using a rolling pin, making sure the dough is even. Once rolled out, add the filling. Pour and spread caramel apple mixture over the dough. Cut into 12 even rolls then arrange them cut-side-down in the prepared baking pan. Cover the rolls with aluminum foil and allow to rise in a warm environment again for 30-40 minutes. Once risen, preheat the oven to 375°F. Bake rolls for 25-30 minutes until they are golden brown. Cover rolls with aluminum foil in the oven if they begin to brown too much. Remove pan from the oven and allow to cool on a wire rack for 5 minutes. While the cinnamon rolls are cooling slightly,Make the cream cheese glaze by using a hand mixer to whip together cream cheese and butter in a bowl until light and fluffy. Whip in powdered sugar and vanilla extract. 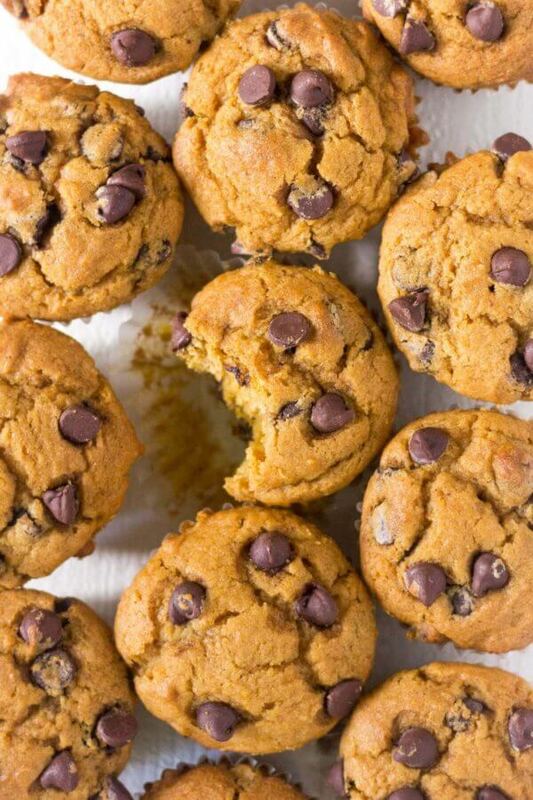 Add enough milk to achieve a drizzle-like consistency. Pour and spread glaze over warm cinnamon rolls. 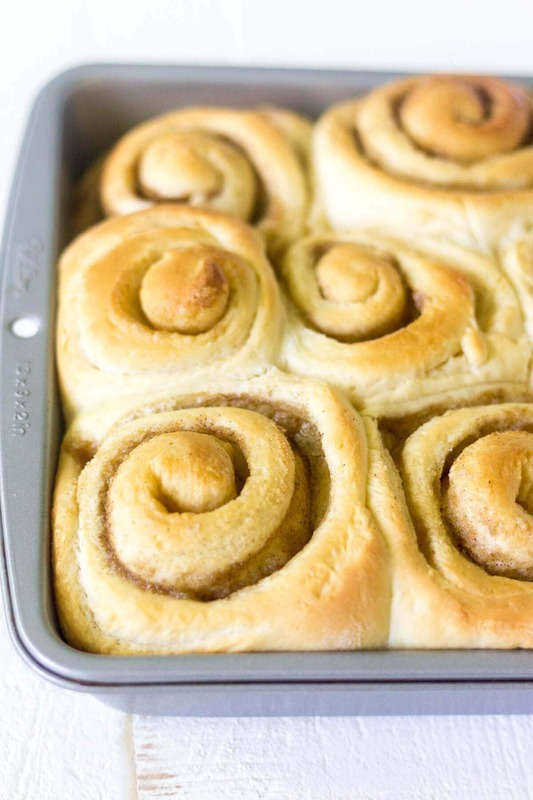 Make ahead: baked cinnamon rolls (without the glaze) can be stored in the freezer for 2 months. Thaw in the refrigerator overnight and bake at 375° for 15 minutes or until warm. Spread glaze on top and serve immediately. 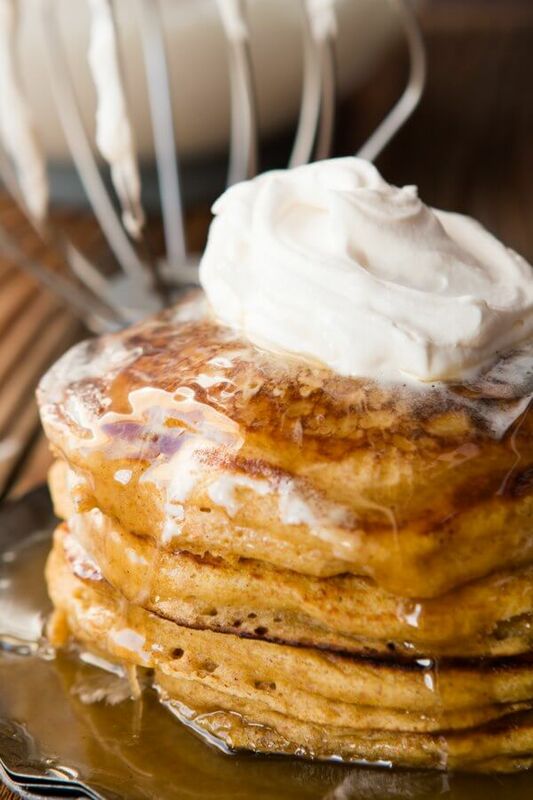 My favorite pancakes of the season! When I tried the filling recipe it was too loose. It was like apples floating in soup…much too loose to use for a filling. I even boiled it a little longer than what the recipe calls for. Could the quantities be off? Sometimes apples have a little extra water content which unfortunately is just one of those things that happens with fresh ingredients. You’ll have to drain off the liquid or add a little cornstarch to thicken. Oh my goodness! These look amazing! Putting them on my meal plan NOW!